Published in Radical Society, Volume 31 (2004), No. 1. Those of us who were reared on the action movies of the Reagan era knew exactly where the names came from. Red Dawn is a 1984 film (featuring a young Patrick Swayze and Jennifer Grey, and an even younger Charlie Sheen) in which America is invaded by the Soviets and the Cubans. Although the end of the Cold War was only a few years away at the time of the film’s release, the ’80s were a decade in which patriotic fervor ran high. It makes sense to me that the movie would now enjoy a revival in Pentagon screening rooms. Like other anti-Soviet movies of my childhood — films like Rambo III and Rocky IV — Red Dawn offers a clear vision of conventional patriotism, and thus seems well-suited to post-9/11 popularity. Yet the insights that such late-Cold War movies provide into U.S. foreign policy are not nearly as straightforward as what one would expect from the muscle-bound genre. Hearing of Saddam’s capture, it occurred to me that returning to those films and looking from a distance at the brand of hyper-patriotism promoted in the 1980s might prove useful for those challenging militaristic visions of national purpose. And that it would be notably uncomfortable for promoters of a “New American Century.” Because judging from their use of Red Dawn, the hawks were getting things very wrong. In case you missed it, in Red Dawn‘s vision of World War III it’s up to a rag-tag bunch of Colorado high school students to form a hit-and-run strike force and take their country back. The guerillas are the heroes. The invading troops are the enemies. The students name their platoon after their high school football team, the Wolverines. As a couple inclined toward Catholic pacifism, my parents detested movies like Rambo. They saw them as embodiments of war-mongering machismo. My brothers and I, on the other hand, had considerable fondness for the “ultimate fighting machine.” John Rambo seemed eminently sympathetic, a man fighting with style and admirable firepower in defense of a just cause. A man to be imitated, in spite of the fact that we were not allowed to own toy guns. The patriotic spirit of Sylvester Stallone’s action hero peaked in the last movie of the series. In 1988’s Rambo III the reluctant ex-Green Beret, acting on behalf of the U.S. government, joins forces with native freedom fighters against the Russians in Afghanistan. He’s hesitant because he has never trusted the army after Vietnam, and he would rather be meditating at the mountaintop monastery where he has retired. “My war is over,” he tells the mission’s recruiter. But after Rambo’s beloved Colonel Trautman (Richard Crenna) is captured by the Commies, the veteran commando goes back into action. Once in Afghanistan, Rambo is convinced by the mujahideen that their battle is righteous. And it is at this point that one sees how the passing years have been unkind to Stallone’s defense of Reaganite militarism. The fact that Osama bin Laden was among the warriors whose insurgency was supported by the CIA only proves the old maxim that one Republican President’s freedom fighter is another’s terrorist. The movie’s dialogue is studded with now-unheeded warnings, and is haunted by the “blowback” that was to come. 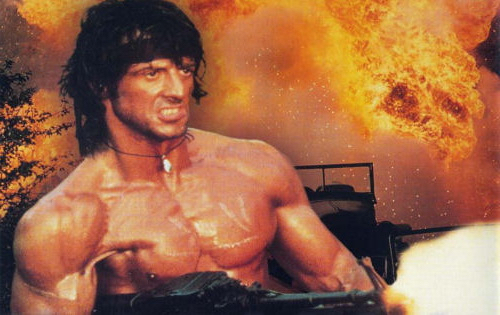 Condoleezza Rice may report that the situation in Afghanistan looks sunny; John Rambo would beg to differ. Note also with this speech that even an enthusiastic movie about the Cold War (the closing frame of the picture reads, “This film is dedicated to the gallant people of Afghanistan”) gives a rather unromantic view of Vietnam. In fact, Rambo III furthers a striking shift in the series away from Vietnam-related criticism of the government and toward pro-White House propaganda. The forlorn Rambo walks down the highway, where he is spotted by a small town sheriff (played by Brian Dennehy) who dislikes the looks of the long-haired drifter. In the sheriff’s office, Rambo is beaten with a nightstick and brutally washed with a high-pressure hose. After the ex-POW flashes back to scenes of wartime torture, his survival instincts kick in. He breaks free from custody. The movie follows the tragic unfolding of ensuing manhunt. Yet even Rambo II‘s patriotism is far more ambiguous than the former President’s endorsement implies. In the movie’s main plot, Rambo is reactivated to travel to Vietnam and search for left-behind POWs. However, it quickly becomes clear that Rambo is not supposed to find any POWs, far less to bring any back. For political reasons, Murdoch, the government bureaucrat that concocted the mission, never wanted Rambo to succeed. “Men, goddammit!” the Colonel barks back. Besides the unflattering picture that the movie presents of the war in Vietnam (“a lie”), the most interesting aspect of this dialogue is its relevance for the 2004 presidential campaigns. The real-life villain in Rambo II, essentially, is John Kerry. These allegations are by no means undisputed. In a recent article in The Nation, Tom Hayden calls the claim “incredible” and notes that Kerry gained “bipartisan support, including that of all the Senate’s Vietnam veterans, for a report declaring the MIA legend unfounded.” Charges of betrayal have also been leveled against Senator John McCain, himself a former POW. While Lembcke’s reading overlooks the depiction of the bigoted, all-American sheriff as villain in First Blood, his argument is vindicated by Rambo II‘s tag line: “This time we get to win.” But whatever you make of the series as a whole, it is clear that the movie presenting the biggest problem for today’s “war president” is not the tortured First Blood, nor the anti-government Rambo II. Instead, it’s the unabashedly patriotic Rambo III. By the time I was in high school, I had adopted my generation’s requisite sense of irony and pre-9/11 disdain for any genuinely nationalistic emotion. But before that, there are two times in my life when I can remember chanting “U-S-A! U-S-A!” without shame or sarcasm. One was during Mary Lou Retton’s 1984 Los Angeles Olympics, when the U.S., unopposed by a boycotting Soviet bloc, rampaged through the competition. All of the children in my neighborhood cheered for full-spectrum dominance. Like the last of the Rambo movies, Rocky IV evinces a profound transition in the series. In the first Rocky film, a class parable set in gritty Philadelphia, Rocky Balboa embodies the American spirit as a scrappy underdog who gets a shot at the big fight. Few remember that, even after training hard, Rocky loses the bout the first movie’s climax. But it is a dignified loss, the filmmakers tell us, and that’s what matters. Not so in Rocky IV, when Stallone represents big “A” America and takes on the USSR’s top prizefighter. In this new nationalist framework, losing is simply not an option. The most noteworthy aspect of the movie is its assessment of the relative character and strength of the two superpowers, highlighted in the movie’s training sequence. To get himself in shape Rocky literally takes it to the wood shed, testing himself against the forces of nature. Meanwhile, Drago turns to the power of science. Thus, while Rocky pulls a sleigh across a snow-covered plain, Drago trains in 1985’s conception of an ultra-modern Russian gym (actually filmed in California). As Rocky chops down a tree, Drago pounds a digitally monitored punching pad. Drago runs hard against an inclining treadmill; Rocky runs to the top of a mountain, raising his arms in victory. The problem here is that the vision of a powerful, technologically menacing Soviet state has not aged well. In the 1980s, perpetuating this vision was useful for those who used a hotly contested arms race to justify vast escalations in military spending. In retrospect, however, it only serves to highlight what — new blunders regarding Iraqi weapons of mass destruction notwithstanding — is likely the CIA’s most colossal intelligence failure ever: its inability to predict the collapse of the Soviet Union. The sexed-up analysis about the near-invincibility of Drago’s motherland in fact provides an important precedent to recent scandals around the politicization of intelligence about Iraq. Former Secretary of State George Schulz argued that “CIA analysis was distorted by strong views about policy” which made it ideologically impermissible to report the truth about Soviet weakness. This same intelligence problem afflicts Red Dawn. More than the role reversal suggested by the misnamed operation in Iraq, it’s the vast overestimation of Soviet, Cuban, and — most ridiculously — Sandinista power that proves truly embarrassing in hindsight. It’s an interesting moment, revealing the long-established flimsiness of U.S. multilateralism. Of course George W. Bush’s “coalition of the willing” is a joke. Embattled and alone is the preferred posture of conventional American patriotism. In another scene, Patrick Swayze, the leader of the Wolverines, conducts a summary execution of a captured Russian soldier. “This is in violation of the Geneva Convention!” the POW cries. To which Swayze replies, “I never heard of it.” The scene helps to make the film more edgy and realistic, but doesn’t make you feel all that reassured by White House statements that Guantanamo detainees are being treated humanely. But perhaps you can argue it the other way. Maybe it is impossible to make a truly pro-war movie. Maybe the immediate loyalty that militarism demands fosters a type of patriotism that cannot be comfortably sustained on film. The willingness to wholeheartedly believe in the rationales best suited to a particular political moment also requires a penchant for quick forgetting, one that defies the impulse to make a lasting visual record of human experience. Viewed today, Rambo’s support of the holy war in Afghanistan doesn’t look patriotic at all. Or, to the extent that it does — the extent to which America flags and patriotic hymns have been put at the service of propaganda — it reveals a debased nationalism, an amoral realpolitik. Ultimately, it shows that love of country must be founded on terms other than dominance and conquest. There never was a Rambo IV. Red Dawn did not spawn even a single sequel (although Patrick Swayze and Jennifer Grey did team up again for Dirty Dancing). And like most Americans, young and old, I found Rocky V to be a sorry end to a classic series. No doubt, absent the action titans of the past, other franchises will emerge to justify U.S. military actions abroad, however problematic they may be. I can’t say I welcome these movies. But I’m not sure the Pentagon should either.